In Alabama, it’s always a good time to take a family vacation. Whether you’re looking for a camp-style resort with kid-friendly activities like gem mining and fishing or an ocean-side spot with sparkling pools and lazy rivers, you’ll find it in Alabama. This state has some of the best family resorts around, and here are our 10 favorites. This beautiful lakeside camping resort is a true getaway from life’s daily stresses. Here, you’re on lake time all the time, giving you all the time in the world to enjoy being with your family. If you have an RV, you can book a site in their RV park. They also offer an abundance of lakeview and lakeside rental homes that are perfect for family reunions or other large groups. Pools, playgrounds, a huge water slide, zip line, mini golf, sports activities, and lake access will give you plenty to do during your stay. With a theme built around the fictitious Jellystone Park and everyone’s favorite picnic basket-stealing bear, this camping resort will leave you and your kids wanting for nothing. The amenity-packed park offers swimming pools, scheduled activities, wildlife encounters, a lake, gem mining, fishing, and more, all of which is included in your stay. The park is located just a few minutes from some of the Gulf Coast’s most highly acclaimed attractions, including OWA, the Track, and Waterville USA. This oceanfront resort has everything a family needs for an unforgettable vacation: direct beach access, swimming pool, spacious suites, splash pad, surfing lessons, kayaks, and plenty of privacy. Some of the best sights and sounds in Orange Beach are just minutes away. This RV and camping resort is unlike any other you’ll ever experience. RV owners and tent campers alike are welcome at this amenity-rich family resort. Including in your stay are beach access with water slide, catch-and-release fishing pond, playground, picnic area, pool, and other community areas perfect for large groups and small families alike. But the most unique and beloved feature is the private light rail that travels the perimeter of the resort. Guests can enjoy a ride whenever the mood strikes, as well as explore the train park for prime photo opportunities. A sprawling 400 acres of this wooded resort gives families everything they’re looking for in a vacation. Situated on glistening Wilson Lake, you get accommodations that are the next best thing to being in the comfort of your own home. Each spacious cottage offers a fireplace, satellite TV, waterfront views, grill, hammock, and private pier for ultimate relaxation. The community is an outdoors-lover’s dream: guided fishing tours, nature trail, playgrounds, volleyball, beach area, guided quail hunts, and a sporting clay range are just a few of the many surprises you can enjoy during your stay. With two beachfront properties (the Beach Club and Turquoise Place), Spectrum Resorts ensures you’ll never have to leave the resort to have an amazing family vacation. On-site you’ll find lazy rivers, crystal clear pools, playgrounds, and beach access to keep your days filled with fun in the sun. They also offer several dining options so you never have to spend your vacation cooking or driving all over town searching for good food. Guests love the variety of accommodations, including sprawling condos that can house large families. Wake up to the sight and sound of the ocean, then hit the sand for a day of play. This oceanfront resort is perfect for families, thanks to amenities like full kitchens, multi-bedroom accommodations, Wi-Fi, DVD player, grills, swimming pool, and more, all included in your reservation. 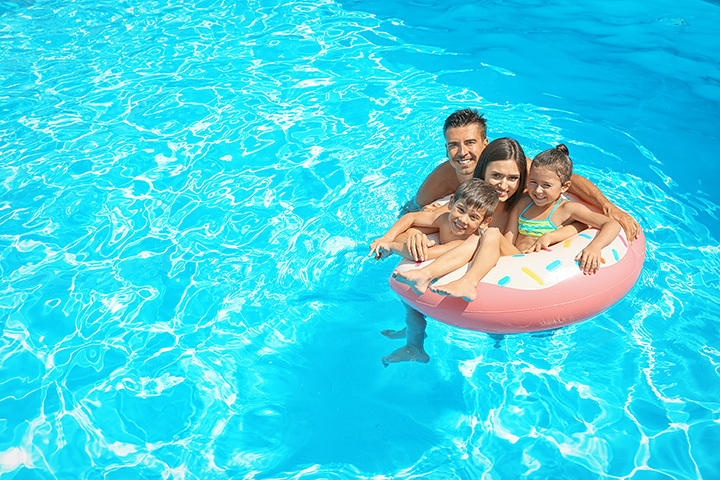 The resort is also in close proximity to shopping and other area attractions to keep every member in your party happy. Fully-furnished, individually-owned condos are set against an oceanic backdrop in this resort-style community. Each room is uniquely furnished and well-kept, with everything you need for your family vacation experience. On-site you’ll find pools, putting green, tennis court, hot tub, small library, saunas, and other amenities to help you create life-lasting memories. There’s no place quite like it anywhere else in Gulf Shores. If you have a camper, you’ll be in plenty of good company at Johnny’s Lakeside RV Resort. This family-friendly RV campground is the remedy families need to enjoy some quality R&R with each other. Kids and adults alike will love the resort-style pool with towering water slides, playground, game room, stocked lake, and walking trails that leave you with plenty of options on how to spend your vacation. Clean and accommodating, Staybridge Suites in Gulf Shores is in close proximity to white sandy beaches and some of the top attractions in the area. Free wireless internet and complimentary breakfast make it the perfect place for families on a budget, not to mention lower rates than most beachfront hotels because of its inland location. Guests can take advantage of clean rooms, an outdoor pool, picnic area, and barbecue grills on the property, plus meeting spaces ideal for family reunions.